ISC will be releasing new sets on June 13. Here's two samples I created with the Batik Flower Background, to show two totally different looks. On this card I used the Spectrum Roll Technique (TJNL) with my Celebration Spectrum Pad. 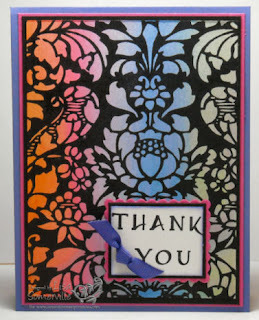 The sentiment is from the same sheet, stamped then layered, the scallop is cut using my Nestabilities. 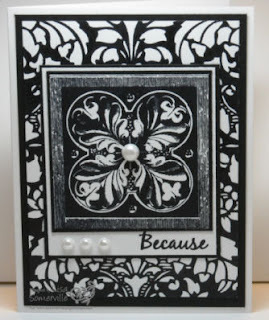 On this next card I used last weeks Bloggers Challenge - Black and White and combined it with a layout that was inspired by a card I had received from Nancy Judd. The Batik Flower BG is stamped in Black on the back panel, for the smaller panel I used an image from the new Artsy Victorian Plate. The sentiment is from the new Thoughtfulness Plate. The white beads are from SU's Pretties Kit. Stunning creations all of them with the ISC new release..I can see that is a must have for me.